Two new stocks make September’s Exec Comp Aligned with ROIC Model Portfolio, available to members as of September 14, 2018. Our Exec Comp Aligned with ROIC Model Portfolio (+1.3%) underperformed the S&P 500 (+2.5%) last month. The best performing stock in the portfolio was up 9%. Overall, six out of the 15 Exec Comp Aligned with ROIC Stocks outperformed the S&P in August, and nine had positive returns. Get the best fundamental research. Colgate-Palmolive (CL) is the featured stock in September’s Exec Comp Aligned with ROIC Model Portfolio. Colgate was previously featured as a Long Idea in May 2018. Over the past decade, CL has grown revenue by 1% compounded annually and after-tax operating profit (NOPAT) by 3% compounded annually. CL’s NOPAT margin has improved from 15% in 2007 to 18% over the trailing twelve months (TTM) and it has generated free cash flow (FCF) of $12.7 billion (21% of market cap) over the past five years. Colgate-Palmolive has used ROIC to determine executive salaries, annual bonuses, and long-term incentives since 2014. This focus on improving ROIC aligns the interests of executives and shareholders and helps ensure prudent stewardship of capital. Shareholders can be confident that CL executives will avoid overpriced acquisitions like Newell’s (NWL) deal for Jarden. We believe this superior corporate governance is an underrated competitive advantage. CL’s executive compensation plan lowers the risk of investing in the company’s stock because we know executives’ interests are tied to real value creation. 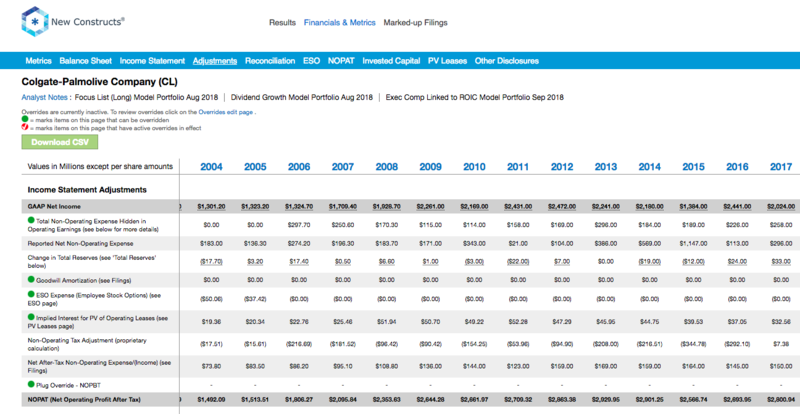 At its current price of $69/share, CL has a price-to-economic book value (PEBV) ratio of 1.3. This ratio means the market expects CL’s NOPAT to grow by no more than 30% over the remainder of its corporate life. Such an expectation seems pessimistic given that CL has grown NOPAT by 6% compounded annually since 1998. 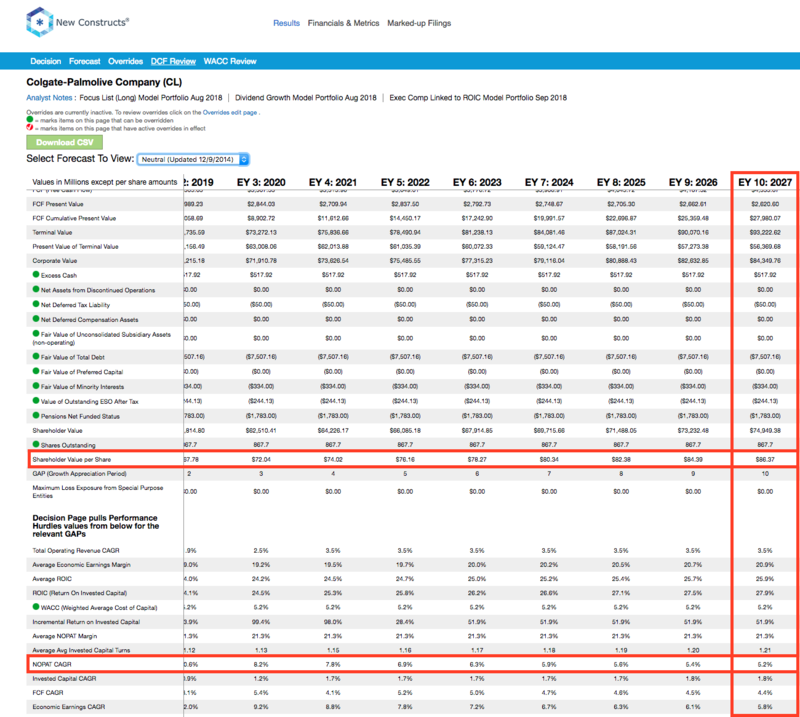 If CL can maintain TTM pre-tax margins and can grow NOPAT by 5% compounded annually for the next decade, the stock is worth $86/share today – a 25% upside. See the math behind this dynamic DCF scenario. In the meantime, investors receive a 2.4% dividend yield. Income Statement: we made $1.0 billion of adjustments, with a net effect of removing $777 million in non-operating expense (5% of revenue). 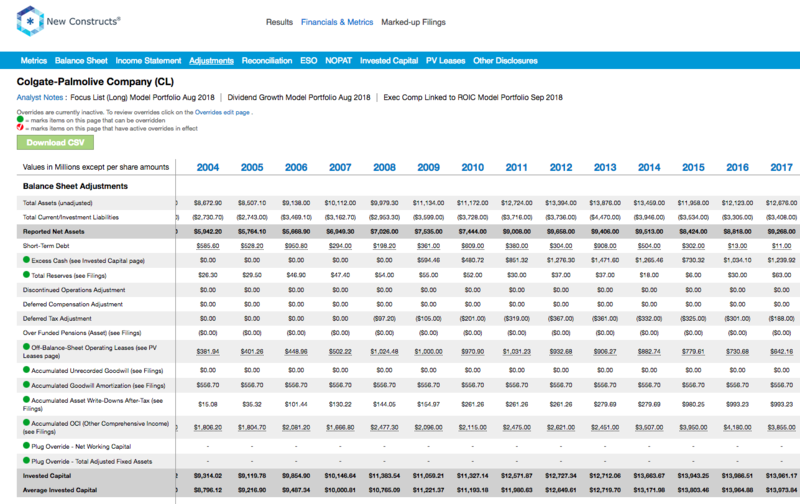 You can see all the adjustments made to CL’s income statement here. Balance Sheet: we made $7.6 billion of adjustments to calculate invested capital with a net increase of $4.7 billion. One of the largest adjustments was $3.9 billion due to other comprehensive income. This adjustment represented 42% of reported net assets. You can see all the adjustments made to CL’s balance sheet here. Valuation: we made $10.4 billion of adjustments with a net effect of decreasing shareholder value by $9.4 billion. Apart from $7.5 billion in total debt, which includes $642 million in operating leases, one of the largest adjustments to shareholder value was $1.8 billion in underfunded pensions. This adjustment represents 3% of CL’s market cap. Despite the net decrease in shareholder value, CL remains undervalued. This article originally published on September 19, 2018.